The current report, which is based on an exclusive collaboration with the World Economic Forum (the Forum), focuses on the technical, societal, and legal and regulatory ramifications of AVs, paying particular attention to the most substantial roadblocks to widespread adoption of AVs and how they can be overcome. We partnered with the Forum in a one-year initiative that explored the question of how to make self-driving vehicles a reality. As part of our collaboration, we convened a working group consisting of senior executives of automotive, technology, and insurance companies as well as public-sector authorities. They participated with us in intensive workshops focused on AVs, the need for multistakeholder collaboration to reap the massive societal benefits that AVs promise, and the forms that such collaboration could take. The era of the autonomous vehicle (AV) is fast approaching. What should automotive companies, suppliers, regulators, legal authorities, rating agencies, road operators, and the public at large do to prepare for what is the greatest inflection point for the automotive industry since the introduction of the assembly line? And what are the most significant technical, societal, and legal and regulatory roadblocks to the development, deployment, and mass adoption of AVs? The Boston Consulting Group and the Forum have jointly developed and explored solutions for the most substantial obstacles to mass-market AV adoption in the social, regulatory, and industrial spheres. Our findings reinforce an overarching message: close cooperation among stakeholders is critical to the timely and successful deployment of AVs. AVs will come in varying degrees of automation and required human interaction. SAE International (a leading global association of automotive engineers), the U.S. National Highway Traffic Safety Administration, and Germany’s Bundesanstalt für Straßenwesen (the federal highway research institute) have defined a framework for vehicle automation. Industry incumbents—that is, OEMs—favor an incremental approach, believing that enabling technologies must mature and that social obstacles must be cleared before fully autonomous operation can be achieved. In the interim, OEMs will follow a well-established path to market, introducing autonomous features first in the premium automotive-market segment. The tech companies and other new entrants favor an alternative approach. In keeping with the tech industry’s culture of rapid prototyping, most challengers are pushing hard for early trials of their technology and use of the findings from those trials to improve the technology on the fly. Rather than introduce their products on the mass market, they will likely seek alliances with fleet operators such as municipal governments, taxi services, or businesses and educational institutions in need of shuttle services to transport people around large campuses. For all their differences, incumbents and new entrants face a common set of challenges, which we review in the chapters that follow. Much of the technology that goes into AVs, especially the software algorithms that control autonomous operations, is proprietary, of course, and will in large part constitute the “secret recipe” by which OEMs and suppliers seek to differentiate themselves. But other technological challenges, such as those relating to cybersecurity, highly precise digital maps, and vehicle-to-vehicle/infrastructure communication, will require a collaborative effort on the part of AV stakeholders. The Indirect Attack. Hackers could exploit the connectivity of AVs and transmit corrupt information to them by manipulating data streams from cellular networks, traffic and infrastructure signals, GPS information, and other sources. Security researchers have proved that such exploits are possible. However, they are neither as likely nor as potentially severe as direct attacks. The Direct Attack. Hackers could gain entry to an AV’s systems and disrupt them to cause an accident or to enlist the AV in a conventional crime such as a kidnapping or murder. Such incidents could demolish public confidence in AVs overnight and undo years of costly R&D. Direct attacks are possible in both theory and practice, as was demonstrated when two “white hat” hackers (computer-adept individuals who use their advanced skills to render hardware and software more, not less, secure) used a cellular base station to imitate the unencrypted data streaming from a large European OEM. The hackers then used the station to instruct one of the OEM’s vehicles to unlock the driver-side door. That was not an isolated incident. Security researchers have discovered and exploited literally dozens of pathways into the hardware and software of numerous different car makes and models. In one sobering, well-publicized incident, two U.S. researchers made news when they connected a laptop directly to the controller-area-network (CAN) bus—the system that connects multiple vehicle functions—of a conventional car. That simple step gave the researchers full control over nearly every system in the vehicle, as they demonstrated by disabling the brakes in a controlled environment. In another incident, Chinese students participating in a hacking challenge at a cybersecurity conference in Beijing in 2014 gained remote access to a brand-new vehicle, unlocked it, sounded its horn, flashed its lights, and opened its sunroof while the car was in motion. Such demonstrations of vulnerability suggest the scope of the automotive industry’s cybersecurity challenge. As one researcher told us, “The real problem is not any individual vulnerability but a security consciousness that relied too long on the notion of a closed system.” Based on this closed-system mind-set, engineers implemented an in-vehicle network, the CAN bus, that is not inherently secure from external intrusions. Because the CAN bus connects all onboard electronic-control units (ECUs) within a vehicle, hackers can compromise one system—even a relatively minor one—to gain access to the full array of vehicle functions. Automotive-security limitations are not a matter of mind-set alone, however. Embedded devices, such as onboard sensors, controllers, and bus systems, are of necessity robust, inexpensive, and small, limiting their capabilities. Endowing them with additional capabilities, such as real-time cryptography, is proving to be a significant challenge. Because it is impossible to eliminate cybersecurity threats, AV stakeholders must shift their focus to managing them. OEMs will need to collaborate within and across industries and with regulators to recognize threat patterns, develop proactive defense strategies, and coordinate responses. Regulators have turned their attention to this effort. Besides enacting strict general data-protection laws, the European Commission has launched an initiative to design, verify, and prototype a modular system to protect onboard automotive network connections. In the U.S., the National Highway Traffic Safety Administration conducts comprehensive security research to build a knowledge base and investigate possible regulatory frame-works. The U.S. Defense Advanced Research Projects Agency hosts a “Cyber Grand Challenge” to reverse-engineer software to uncover deeply hidden flaws. SAE International has begun to develop strategies to prevent security breaches and minimize the fallout from those that do occur. And recently, the automotive industry has joined the fight, committing to set up an automotive information-sharing and -analysis center (known as auto-ISAC) in the U.S. to document and counter cyberthreats. One approach for OEMs to increase cyber-security could well be the establishment of a market for security information. (See Exhibit 3.) Such a market could be structured as a three-party forum consisting of security analysts, researchers, and hackers on the sell side; a clearinghouse in the middle; and the automotive industry on the buy side. Analysts, researchers, and hackers (collectively referred to as reporters) would report AV-related security vulnerabilities to the clearing-house and commit not to disclose information about the vulnerability to the public. The clearinghouse would arrange payments to reporters on a sliding scale proportional to the gravity of the vulnerability and inform industry players affected by the flaw; those players would take responsibility for remediating it. Such a market could produce rapid improvements in security by making crucial threat-related information tradable. Every product has vulnerabilities that malicious actors will eventually discover, and a market system that channels information about those vulnerabilities to OEMs and suppliers would benefit all stakeholders. Such markets have already proved successful in the IT industry, where companies including Facebook have developed “bug bounty” programs that pay reporters a fee for every vulnerability they discover. Google even pays bounties for flaws found in vital open-source programs. In addition, AV stakeholders could borrow best practices from other industries to expose and mitigate threats before they occur. In particular, the IT and financial industries, with their well-established ISACs, could serve as a starting point. Sensors and sensor fusion technology are necessary to AV operation, but they are not sufficient. AVs also need high-definition (HD) maps that are accurate within less than ten centimeters to make sense of their environment. (See Exhibit 4.) The combination of sensors and maps enables AVs to correct for data inconsistencies, determine the vehicle’s precise location, and navigate the environment. Moreover, HD maps serve as a cross-check against sensor readings and help AVs to perform a reality test on the surrounding environment. Thus, they can tolerate only small differences between their digital maps and the physical world. In case of large deviations, AVs simply cannot move. Road configurations are in a state of constant flux, owing to construction, alterations to structures in the surrounding environment, detours around damaged road sections, and other factors. Unexpected alterations in lane configuration or other anomalies can render operation problematic or impossible. HD maps must therefore be constantly updated, and the updates must be downloaded to AVs on a timely basis. Because AVs must store a local copy of the map to ensure proper operation in case of an interrupted Internet connection, a solely cloud-based solution will not suffice. At present, digital maps used for route instructions are accurate within ten meters and include the location of streets and intersections, as well as any restrictions on traffic movement such as one-way streets. That’s precise enough to enable the transmission of turn-by-turn navigation instructions both to human drivers and to advanced-driver-assistance-system (ADAS) applications such as steering assistance. Maps for more sophisticated ADAS applications require a higher degree of precision, including the locations of traffic lights and other signals and, for a given roadway, the number of lanes, the gradient, and the geometry of curves. These refinements allow for better route advice, such as speed recommendations for tight turns. Partially and fully automated vehicle operation will require maps that are even more detailed and accurate. They must capture the exact geography of the driving environment, including landmarks and the precise position, gradient, and curvature of road lanes, to mimic (and improve upon) human calculations such as optimal acceleration and braking points. Currently, HD maps suitable for AV applications are produced by tech companies such as Here (a Nokia business that at the time of writing is for sale), Google, and TomTom, but they cover only a limited number of routes in a limited number of countries. Vast stretches of primary, secondary, and tertiary roadways remain to be charted. For example, Germany, Japan, South Korea, and the U.S. together contain more than 8.5 million kilometers of road surface. As of late 2014, tech companies had created AV-quality maps for only a few thousand kilometers of road. How can more extensive mapping be accomplished with the required degree of precision? The most likely solution is that several private-sector companies will compete to produce the maps on which AVs depend. OEMs will aim for at least a duopoly among suppliers, reasoning that competition will generate higher-quality maps. Cost should not prove an obstacle to private-sector map generation. We estimate that the cost of mapping, consisting mainly of data collection and processing, all 4.3 million kilometers of primary and secondary roads in the U.S. would be small relative to overall R&D costs. Once they’re created, maps need to be updated dynamically. Because the timing of these updates is critical, stakeholders might want to consider collaborating to execute them. In the absence of such collaboration, a situation could arise in which one model of AV cannot proceed through a construction zone while another model can proceed unscathed. In practice, any effort to collaborate on maps faces two significant challenges. The first challenge is data collection. It will be necessary to gather data from a multitude of sources, including crowdsourced sensor readings from the AV fleets of various manufacturers and data provided by road authorities and construction companies, government authorities, and other sources. Data processing and dissemination form the second great challenge. Map providers will have to possess the capacity to rapidly check the accuracy of all incoming data to avoid misuse and to convert and normalize data, as well as to integrate updates of small areas into the existing map. Stakeholders must therefore cooperate on data standards to ensure that information collected from multiple sources, including AVs themselves, is interoperable. And map providers must be able to update AVs in real time. As yet, no formal mechanisms for gathering, analyzing, and updating map data are in place, and business models for monetizing those activities have yet to be devised. But a crowdsourcing model could provide the foundation for such an undertaking. Private-sector stakeholders could agree simply to share all crowdsourced AV sensor data in a standardized format or share only the data that’s relevant to safety. One of the more divisive questions hanging over the development of AVs is whether they will require vehicle-to-vehicle (V2V) communication and its allied technology, vehicle-to-infrastructure (V2I) communication, to operate autonomously and safely. The two technologies are collectively known as V2x. From a strictly technical standpoint, V2x is not needed for AV operation. Many AVs now under development are designed to operate without it, relying only on internal sensors to perform driving tasks. Engineers have proceeded on the assumption that AVs can and should be self-contained, reasoning conservatively that V2x might never be widely adopted and that most vehicles on the road will not be V2x-capable. Even if that assumption is overly conservative, V2x will be of only limited value when AVs first reach the market, because initially low adoption rates will preclude the network effects that amplify the technology’s utility. In practice, however, combining AV and V2x technologies could significantly improve AV operation. V2x communication, which is based on the 802.11 Wi-Fi standard, could enhance AV safety by, for example, enabling the vehicles to “see around corners”—that is, to locate and monitor approaching vehicles—at intersections. It could also be used to warn drivers of nearby potholes or of accidents farther up the road, or to monitor traffic lights and other components of the local transportation infrastructure. As adoption rates for AVs increase, V2x will likely become increasingly necessary as a substitute for driver-to-driver visual communication. Without V2x, AVs could increase congestion rather than relieve it. Here’s how: AVs will be programmed to drive defensively. In complicated situations, such as merging into flowing traffic from an on-ramp, their driving style could, without vehicle-to-vehicle coordination, result in slowdowns or full stops that could exacerbate congestion. Ensuring Trustworthy V2x Communication. V2x data must be protected from outside interference, and the system must include a security infrastructure to credential each V2x message. Allocating Adequate Radio-Frequency Spectrum for V2x. The U.S. Federal Communications Commission has allocated the 5.9 gigahertz space on the radio spectrum for V2x communications and is considering opening the frequency to other uses, such as private Wi-Fi networks. Before regulators take such action, it will be necessary to test whether making the spectrum available for other uses will impair V2x functionality. Resolving Uncertainty over Liability. V2x exposes OEMs to more risk than today’s onboard safety systems, whose proper use is still the driver’s responsibility. AVs cannot control the information transmitted to them by other vehicles, which may significantly complicate the assignment of responsibility for accidents. Relieving Consumer Concerns About Data Privacy. Users will demand certainty that V2x systems will not collect or store personal information about them or their passengers. Developing a Mechanism for Maintaining and Broadcasting Updates to V2x Software. Concerns over maintenance could hinder the widespread adoption of V2x technology. Stakeholders can address these concerns by implementing automated up-dates of security certifications. Work in these areas has already begun. Trials of V2x communication are now under way in Europe and the U.S. In Europe, a group of stakeholders, including public-highway authorities and toll-road operators, municipal officials, and OEMs and suppliers, are setting up a V2x corridor on roads running through Austria, Germany, and the Netherlands to demonstrate the potential of real-time information sharing. Communicating using short-range Wi-Fi or radio, the system will initially focus on issuing warnings about road construction and traffic conditions. Such a system could, in theory, point out traffic jams in time for drivers to take an alternate route and detect risks before they become threats. In the U.S., a similar trial of V2V is under way in Ann Arbor, Michigan. Achieving and maintaining societal acceptance is critically important to AV adoption. It may ultimately prove to be a greater challenge than technology development, with a more uncertain outlook. Strong societal resistance would severely impair the introduction of AVs. The introduction of Uber’s taxi-hailing app in Europe, which was ultimately enabled by widespread smartphone penetration, serves as a cautionary example: unlike in the U.S., where Uber is popular and widely used, the service faces substantial opposition from taxi operators and unions, which have, among other things, obtained injunctions against the company’s activities in Belgium and Germany and organized fierce demonstrations in France. This opposition from entrenched interests underscores the social difficulties of adopting new mobility forms. While it seems fair to assume that societal resistance is unlikely to completely prevent a technology that promises such large, far-reaching societal benefits, the objection certainly may delay adoption. Yet a substantial delay in AV adoption could needlessly put thousands of lives at risk. The key challenge will be to ensure societal acceptance, even given the possibility of terrifying accidents, while at the same time balancing competing interests. Overcoming this challenge requires close collaboration between involved parties, in particular industry and policy makers, to address concerns appropriately (for example, by setting strict safety standards) and transparently as well as to offer economic alternatives to those negatively affected. Creating and maintaining emotional buy-in will be the crucial task when dealing with the general public. At the moment, public opinion is highly favorable toward AVs, with polls showing that 60 to 80 percent of consumers across a wide range of regions believe AVs will benefit society. As discussed at length in the first report in this series, Revolution in the Driver’s Seat: The Road to Autonomous Vehicles, drivers in the U.S. have high expectations for AVs but also some doubts about them. Approximately half are open to buying a vehicle with autonomous features. (See Exhibit 6.) But they also cited concerns about safety, operational reliability, and cybersecurity, as well as uncertainty about AV interactions with other vehicles on the road. Furthermore, a single catastrophic accident could change opinions from positive to negative overnight. If, for example, a horrifying fatal crash that involved an AV was to occur within a few weeks of the technology’s market introduction, public confidence could be shaken for a generation. This possibility underscores the importance of careful communication that does not promise more than the technology can deliver. Transparent statements about both the benefits and the possible limitations of AVs will do far more to generate trust. Clear, consistent, and truthful messaging, crafted with the consumer’s perspective in mind, is in the interest of all concerned. By stressing that AVs can save thousands of lives every year, allow their owners more time with friends and family, reduce the stress of congestion, save fuel, and protect the environment, OEMs and challengers alike can frame the promise of AVs in terms of their impact on the everyday lives of consumers, thereby generating emotional buy-in. At the same time, it’s important not to let expectations run too far ahead of reality. To maintain consumers’ goodwill, AV marketers need to remind the public early and often that it will be some time before the vehicles are widely available and that their use will be limited at first to certain carefully defined driving situations, such as traffic jams or highway driving. Perhaps most important of all is the need to generate and maintain societal consensus around AVs so that when setbacks occur, it’s clear to society at large that everyone has a stake in the technology’s success and can rely on industry and policy makers to work together to overcome unexpected issues as they arise. Like the general public, policy makers are generally supportive of AVs, seeing them as an effective means of achieving policy goals such as Vision Zero—that is, the elimination of traffic fatalities—reducing congestion, promoting economic growth, controlling infrastructure costs, and reducing pollution. Those issues are often a central concern of the leaders of the world’s megacities, which all wrestle with the problem of too many cars on too few roads. Policy makers, however, also have different priorities, depending on whether their role is to regulate or to provide services. And they are susceptible to public sentiment, which could, as we have noted, take a sharply negative turn at the first sign that AVs are falling short of expectations. They could also be swayed by the views of those negatively affected by AVs. As regulators develop their approaches to AVs, one of their top-of-mind concerns will be to avoid proposing policies that could inadvertently block the development of promising technologies. So, rather than impose new regulations proactively, they will likely take a wait-and-see approach and allow technological development to play out with minimal interference. Government bodies with budgetary and spending authority, mindful of physical infrastructure’s long investment horizons, will likewise wait and see before setting spending priorities. As one European government minister told us, “We are not sure if we should invest now in information- and communications-technology infrastructure or road infrastructure. And what about railroads?” Given such questions, governments will likely deliberate long and hard before reaching any firm conclusions. Looming over policy makers’ deliberations is the specter of public opinion, which is volatile and could turn sharply negative if early AVs encounter setbacks. Policy makers are susceptible and responsive to shifts in public sentiment as well as the views of businesses and individuals negatively affected by AVs, and they could be forced by popular opinion to delay the introduction of new technologies. To overcome potential resistance from these quarters, OEMs, new entrants, and other players in the AV ecosystem must advance on multiple fronts simultaneously. While engaging with the general public and negatively affected third parties to maintain positive momentum, they must work with governments to reconcile potential information asymmetries. At the same time, they must collaborate closely with policy makers on pilot programs to demonstrate the viability of AVs, such as those now under way in the Netherlands; Singapore; Göteborg, Sweden; and the UK. The prospect of the widespread adoption of self-driving vehicles could generate intense opposition among businesses and individuals that are negatively affected or anticipate a negative impact from the technology. This group includes not just taxi and truck drivers but automobile dealers, parking-facility operators, and personal-injury litigators, among others. In what could be a precursor of things to come, Tesla’s direct-sales model, which the company justifies on the basis of the need to educate consumers about a new technology, has sparked lawsuits and lobbying blitzes by U.S. dealers concerned that Tesla’s alternative approach could undermine their business model. To date, these efforts have persuaded lawmakers in several states to pass laws banning direct sales of automobiles. In the end, though, society stands to gain so much from AVs that their acceptance is all but inevitable. Rather than wage a doomed battle against progress, affected incumbents might be better advised to use the current “calm before the storm” to adapt their business models to this new technology and position their businesses to profit from a new era of mobility. That is the key message that OEMs, dealers, and suppliers must convey while they work with governments on good-faith efforts to mitigate the impacts on those most negatively affected. These efforts could include providing job-retraining and -placement services and compensation for income losses from unemployment. Governments could also gradually adjust the number of truck and taxi licenses they issue in order to manage the long-term reallocation of labor. And they should prepare affected parties for what is to come by educating them about the trajectories of technological development and market adoption. A government-run or -sponsored program aimed at promoting and encouraging research into innovative ways to tap into the coming technological revolution could supplement these measures. This chapter offers a high-level and strategic discussion of regulatory issues and their larger societal, regulatory, and business implications. This discussion should not be construed as detailed legal analysis or legal advice of any sort. Am I legally allowed to “drive” an AV on public roads? Do I need a formal approval, or homologation, for my AV to, for example, comply with safety standards? What happens if my AV is involved in an accident? Who will pay? Adjustments to Traffic Regulations, in Particular Outside the U.S., to Allow Operation of AVs on Public Roads. Such operation is at present illegal in the many jurisdictions that bar vehicles that can operate without human intervention. The Evolution of Homologation Standards (the Technical Set of Rules and Testing Procedures for Certifying Vehicles as Roadworthy) to Allow AVs’ Market Introduction. Current type-approval standards in Europe and elsewhere bar AVs from coming on the market. Managing the Transfer of Liability Burdens. In the U.S. and possibly other jurisdictions, the burden of liability could shift from driver to manufacturer. Regulators, in consultation with OEMs, insurers, and consumer agencies, need to manage this transition carefully to prevent uncertainty and delays in AV introduction. Traffic regulation poses few obstacles to the development of AVs in the U.S., even though the definition of “driver” in many laws probably requires a review. Most experts on the matter believe that, in the words of legal scholar Bryant Walker Smith, AV operation is “probably legal” in the U.S.1 And at least four states—California, Florida, Michigan, and Nevada—and the District of Columbia have enacted legislation to more precisely delineate the legal framework for AV operation within their borders. International regulations, however, are a very different matter. The 1968 Vienna Convention on Road Traffic, which sets the tone for traffic regulation throughout most of the EU, many parts of Asia, South America, and other jurisdictions, states that “every driver shall at all times be able to control his vehicle.” (See Exhibit 7.) Other language in the convention is also unambiguously clear about the obligation of human drivers to maintain control. Bryant Walker Smith, “Automated Vehicles Are Probably Legal in the United States,” 1 Tex. A&M L. Rev. 411, 2014. That obligation could change, however. Austria, Belgium, France, Germany, and Italy have jointly proposed changes to the Vienna Convention’s language to allow for autonomous operation as long as autonomous features “can be overridden or switched off by the driver.” Signatories to the convention approved the modified language in early 2014, and it will take effect, in most cases through translation into local law, during the course of 2015, with the first new legislation likely enacted by the countries that proposed the modification. In the meantime, testing of AVs under specific circumstances is legal, either through special permits granted for that purpose, as in Europe and Japan, or through legislation, as in the U.S.
As in the case of traffic regulation, the U.S. approach to homologation throws up few if any explicit barriers to certification of AVs. For the most part, OEMs and suppliers operating in the U.S. self-certify their vehicles and components, affirming that the vehicles and components comply with Federal Motor Vehicle Safety Standards (FMVSS), which are disseminated by the National Highway Traffic Safety Administration (NHTSA). NHTSA generally waits until new technologies reach the market before issuing certification standards. Should a vehicle or a component technology prove unsafe or defective after it comes to market, NHTSA is empowered to order its recall. NHTSA has for the most part taken the same after-the-fact approach to the development of AV technology. OEMs and new entrants thus have wide scope to combine existing technologies and develop new ones to enable autonomous operation. Outside North America, most notably in Europe and Asia, regulators take a different stance. Their type-approval approach requires manufacturers to demonstrate that each vehicle model complies with minimum safety and environmental standards before it is allowed on the market. Federal performance standards would likely require additional regulation to preempt state tort law. Also refer to the similar discussion in the liability section. At present, several paragraphs in the UNECE and EU rule set explicitly prohibit self-driving features. For example, regulation 13-H requires that brakes be actuated by human “muscular energy” or by energy controlled by the driver. Regulation 79 rules out electric steering, effectively barring self-steering vehicles, and prohibits the use of automated controls at speeds over 10 kilometers per hour. In early 2015, the UNECE working party WP.29 reviewed proposals to change existing regulation by incorporating technical provisions allowing AV operation as well as to introduce policies and guidance for new use cases, such as highway autopilots. The roadmap for 2015 and beyond suggests a need for further regulatory provision. The crucial question will be: Can necessary regulation changes occur at the pace of technological development? The aim of regulation, whether of AVs or conventional automobiles, is to ensure that they are safe and roadworthy. But how can safety be proved to the satisfaction of regulators, the industry, and the public? The two key elements of any safety regime are a governing framework of rules, principles, and standards and test procedures to prove compliance. At present, neither element is in place. 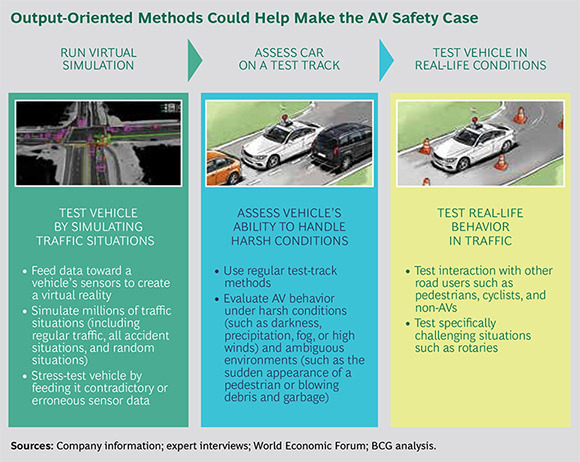 No regulatory body in the U.S. or Europe has issued AV-specific guidelines, nor has the automotive industry proposed a metric of its own beyond the International Organization for Standardization 26262 safety standard. That standard addresses only functional safety and is largely silent on the question of operation. It defines only the lower limit for a new vehicle or component seeking certification, requiring that it be safer than comparable vehicles or components already on the market. Any governing framework will need to define just how safe is “safe enough” and decide how much safer AVs must be, in comparison with human drivers, to earn certification. One possible solution is to introduce the “reasonable driver” as an abstract basis of comparison. AVs would need to be at least as safe as the reasonable driver, as measured by clear, consistent, quantitative KPIs. Regulators could then issue mandatory performance requirements based on those measures and comparisons. Devising robust test procedures may prove an even greater challenge. Traditional test methods can confirm that AVs fulfill all conventional functional requirements, but they cannot ensure that highly complex AV technology is performing to specifications. Conventional brake tests alone, for example, cannot ensure that an AV will come to a timely stop, because software plays an indispensable role in AV braking. Regulators must instead devise new standards to gauge the performance and reliability of algorithms and other software. Few regulatory bodies, however, have the expertise to formulate those standards or create safe-guards to protect the intellectual property of OEMs and suppliers. Rather than test software directly, regulators could instead observe and measure the outputs of software operation. (See the exhibit below.) Testing, with regulators closely involved from the very start of test design, could consist of virtual simulations that could be carried out without endangering lives or vehicles. The tests should assess how well AVs interact with non-AVs; adjust to adverse weather conditions such as fog, high winds, or heavy snow; and handle difficult road situations, such as navigating a rotary in heavy traffic. Because not all traffic situations can possibly be known in advance, virtual tests could randomize situations, including high-frequency scenarios (as determined through the analysis of millions of accidents) as well as low-probability events with potentially catastrophic outcomes, such as scenarios in which some AV sensors fail or other drivers behave irrationally. Such an approach would enable testers to simulate a far wider range of events than conventional tests could encompass. Once AV-testing simulations have been concluded successfully and the compiled data has been analyzed, regulators and industry parties could move on to established methods such as live testing in traffic or on a test track. Liability: A Shift Requiring Careful Management in the U.S. Although traffic regulations and homologation regimes tend to be more favorable to AVs in the U.S., liability laws generally work to the advantage of OEMs in Europe. In Germany, for example, vehicle owners are liable for every accident that occurs as a result of vehicle operation, whether or not they are at the wheel at the time of an accident.3 The law deems vehicle operation a risky endeavor in and of itself and therefore holds the originator of this risk—the owner—liable in case of accident, whether its cause was driver error, technical failure, or some other factor. Vehicle owners have also been found liable in cases of the failure of driver assistance systems. Drivers, who are not in every case the owners, share the liability burden with the owner but can try to prove in court that they are not at fault.4 Exceptions to the liability standard for both owners and drivers can be granted if another party in traffic is found to be at fault or in cases of force majeure such as severe weather. In addition, both owners’ and drivers’ financial liability is capped. Moreover, before any vehicle can legally operate on the road, it must be covered by an insurance policy that shields both owner and driver from third-party claims. As a result, the financial consequences of an accident for an individual are usually limited to increases in postaccident insurance rates. OEMs, on the other hand, risk exposure in two cases: if the manufacturing is faulty or if a product falls short of the expectations of a reasonable consumer. Reasonable expectations as per the EU product liability directive are assessed based on product presentation, the purpose of the product, and the time of market introduction. OEMs can therefore at least influence their level of liability by managing consumer expectations. They can accomplish this by, for example, informing or prominently warning consumers about any limitations to their technology and avoiding inflated claims of effectiveness. In practice, liability concerns will likely not pose a significant obstacle to AV adoption in Germany—a view shared by experts in the legal aspects of autonomous driving in Germany, who believe that liability will not shift much between consumers (as owners or drivers) and the OEMs as a result of the introduction of partially autonomous vehicles. However, insurance companies might bring claims against OEMs on product liability grounds. Consumers are unlikely to be concerned about liability: because of widespread insurance coverage, consumers’ costs are effectively capped in case of an accident, even though technically they remain liable. Insurers, meanwhile, might remain neutral to AVs because such vehicles promise to reduce overall accident rates and thus insurers’ expenses—but they might also reduce the insurance industry’s profit pool. In any case, insurers may still sue OEMs on consumers’ behalf on grounds of product liability; however, few such suits are likely. Because AVs rely on computer code to operate properly, it will be difficult if not impossible in most cases to prove that faulty software (rather than a driver) is responsible for a particular accident when the fault is buried within millions of lines of code. The situation in the U.S. is very different. Legal experts suggest that “the existing liability regime does not present unusual liability concerns for owners and drivers.”5 The liability of manufacturers (and their suppliers), however, will likely increase. (See Exhibit 9.) The fear of potentially large financial losses may in turn increase the chance that OEMs will opt to stop or delay AV development efforts, ultimately delaying AV adoption. German Road Traffic Code (StVG), § 7. German Road Traffic Code (StVG), § 18. Autonomous Vehicle Technology: A Guide for Policymakers, Rand, 2014. The Shift of Decision Making from Driver to Manufacturer. Because OEMs (or their suppliers, or both) devise the algorithms that govern the functions of AVs, they have more influence over vehicle operation than they would over a conventional vehicle. The Connected Nature of AVs. AVs are, of course, highly connected devices, and courts may therefore conclude that manufacturers are more knowledgeable about the status of any given AV at any given time than its driver could ever be. To limit their liability, manufacturers could thus potentially be obliged to monitor the performance of AVs after they’re sold and to intervene in the case of a malfunction. Increased Consumer Expectations. Consumers could, with or without the encouragement of OEMs, come to expect full reliability from their self-driving vehicles and therefore operate them with less caution than required. They could, for example, operate a vehicle in autonomous mode in city traffic, even if the vehicle’s autonomous features are intended for use only on highways. Managing this shift of liability is the central regulatory challenge in the U.S., and it will require the cooperation and collaboration of the auto and insurance industries, regulators, and lawmakers to devise effective solutions. Established approaches to regulation and liability in analogous cases could point the way. These solutions are not mutually exclusive and could be implemented in various combinations and to varying degrees. Probably the most appealing regulatory option would be to shield manufacturers from liability if their vehicles comply with predetermined (and necessarily rigorous) performance standards set by regulators. There are precedents for this approach: in a few cases, U.S. courts, including the Supreme Court, have determined that compliance with NHTSA’s performance standards preempts state tort-law claims. Yet this legal area remains murky and likely requires regulatory clarification if pursued.6 The upside of this solution: it would greatly reduce industry uncertainty over liability and open the way to future improvements in safety and reliability. Still, regulators would need deep technological expertise to develop credible and enforceable standards. A related approach would be to hold AVs to the same standard as human drivers. Under this approach, autonomous operation alone would not shift all liability to the automotive industry. Instead, both AVs and human drivers would be held to a single “reasonable driver” standard, and liability would be allocated according to whether the AV (or the human driver) met that standard. Although this solution would reduce industry and driver uncertainty over shifting liability and hold down litigation costs, it might also discourage manufacturers and suppliers from increasing AV capabilities to levels far exceeding those of human drivers. Insurers and the automotive industry could also consider cooperating to develop quick claim-resolution and subrogation protocols for typical accidents. Such protocols already exist within the insurance industry for crashes such as low-speed “rear enders.” In such cases, the car that bumps another vehicle from behind is assumed to be at fault, with liability allocated accordingly. Extending that approach to manufacturers would require insurers and the automotive industry to set up a framework to distinguish human error from machine malfunction and to collect mechanical and processor data from event data recorders, popularly known as black boxes, in the vehicles involved. Such an approach would help control litigation costs and ensure the prompt settlement of damage claims, but to succeed, numerous manufacturers and insurers would have to reach agreement on the standards of evidence and the definitions of typical accidents. Finally, the government could introduce a backstop to effectively limit the obligations borne by insurers, OEMs, and suppliers. Such a backstop already exists to protect insurers, pharmaceutical manufacturers, and health care providers from, for example, unforeseeable vaccination risks. Whether it would be appropriate for AVs is still in question. The U.S. Supreme Court has come to somewhat contradictory conclusions in these cases, depending on the exact circumstances of each case. We are confident that OEMs, new entrants, insurers, the legal community, and policy makers will overcome the societal obstacles discussed in this report. In the interim, pilot programs are under way in several parts of the world, and we expect more in the immediate future. A likely candidate for such a project would be a megacity whose leaders are keenly motivated to realize a new vision of urban life by addressing such problems as congestion, air pollution, and inadequate public-transportation infrastructure. Similar motivations are behind Singapore’s ongoing pilot program, which was launched in January 2015 with the introduction of a test bed in a confined area of the city where AVs can be piloted. In addition to generating valuable information for municipal officials to study, such pilots would benefit all stakeholders—including the public—by creating an opportunity to understand the benefits and limitations of AVs in a real-life environment and add to the fund of knowledge about AV technology as a whole. Possibly just as important, such pilots would generate empirical data for city planners and other interested parties to study as they consider how to apply new mobility technologies to transport people and goods in urban settings.